When I came upon Jonathan Adler’s post on Instagram about a warehouse sale this week in the Bronx, I had to do a bit of research. Where? How? And most importantly, why? Before I began my research, the name seemed vaguely familiar, but I couldn’t tell you much more than that. 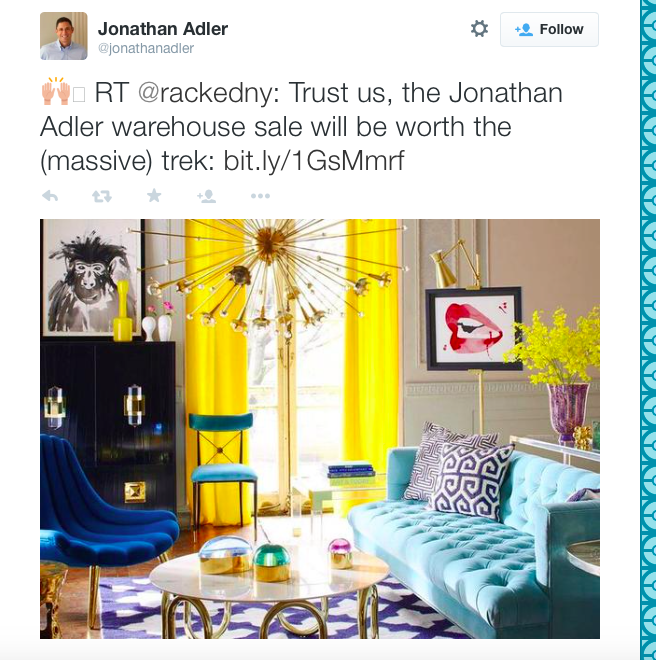 I found that Jonathan Adler, a designer, make some cute, albeit very expensive stuff. Like $100 picture frames. Anyway, I decided to check the interweb to see what the buzz was on the event before I headed down to Port Morris. Note how it says “massive trek”. So, immediately this made it clear to me that this secret warehouse sale is so secret that people in the Bronx are obviously not expected to go. I assure you that my 20 minute journey from Westchester Square to the warehouse on 138th was not massive or grueling in any way. Now, once I got there, I recognized that there were some cute pieces – kitschy lion piggy banks, a gold-colored fox statue, and a cool, Greek-inspired mug – but I was less moved by the price tags associated with the majority of the items (to be transparent, there were some mid priced items as well.) There’s no way I’m paying almost $600 for one chair or $70 for some pottery. It’s just not happening. Especially while I’m renting an apartment like a good chunk of the borough, I’m simply not willing to invest that much into my rental apartment, however cute it may be. Why would this company hold this warehouse sale in a neighborhood where the median income is $19,542? Isn’t it a good thing that the Bronx should be the location of a sale of high end design products? However, there are some Mr. Moneybags Bronxites out here, don’t forget that. Maybe they want some of these designs and it’s nice that they can buy them in their home borough. I picked up a few items and considered purchasing them – the snake mug ($10), a giant lion eraser (I just really like lions) – but in the end, it just didn’t sit right with me to give my money to this company. I thought – they didn’t even expect me, a Bronxite to be here, so why should I give them anything? So I left. But I did snap some pictures, so if you are curious and decide to stop by, you’ll have an idea of what to expect. Further, I’d love for someone from the Jonathan Adler camp to reach out to me and see if we can address some of these questions. Wow. That would definitely have upset me, too. I only moved here a little less than 2 years ago, and I was apprehensive at first, but I really do like it here. I hate how this borough gets treated. I just read something along the lines of “South Bronx to be the next ‘it’ area” and that really freaked me out. My husband teaches there; the students are like his kids… I don’t want them to get screwed over. I am happy to find so many Bronx bloggers, though. That part is awesome. Yes. As resident Bronxites, we certainly want the borough to improve and develop. But I think it’s important that new companies coming into the area to “develop” always consider who is benefitting and how they can help and include the locals.